As he prepares to retire Friday, March 30, Jack Thigpen has received state and regional honors for his two decades leading North Carolina Sea Grant’s extension program. Jack Thigpen and Susan White. Thigpen was recently honored with the Old North State Award. Susan White, North Carolina Sea Grant executive director, nominated Thigpen for the state honor. “Perhaps the best indication of Jack’s legacy comes when our national program requests examples of outstanding university/community outreach and collaboration. The response across the network often is: Call Jack. They know his team is successful,” she says. Sea Grant colleagues agree. 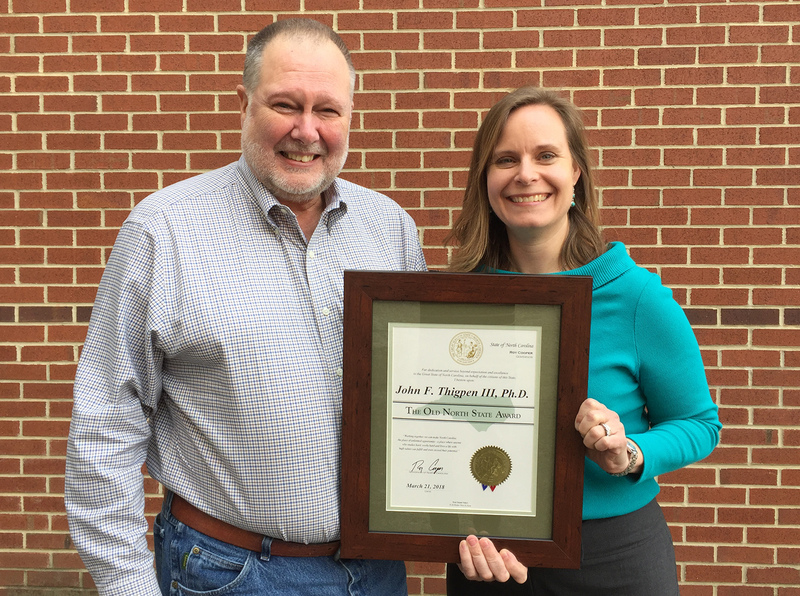 This week, Thigpen also received a Career Extension Award for Vision and Leadership from the Mid-Atlantic Sea Grant Region, which runs from New York to North Carolina. In presenting the award, Tom Murray, recently retired director of Virginia Sea Grant’s extension program, cited the importance of Thigpen’s collaboration and leadership not only to the region, but also to the national network. “Jack has always been willing to help,” adds Murray, who also received a career award from the region. Thigpen joined North Carolina Sea Grant in 1998 as an extension specialist with a focus on coastal recreation and tourism. He initially was based on the Outer Banks, but his work served the entire coastal region known for its beauty and its challenges. 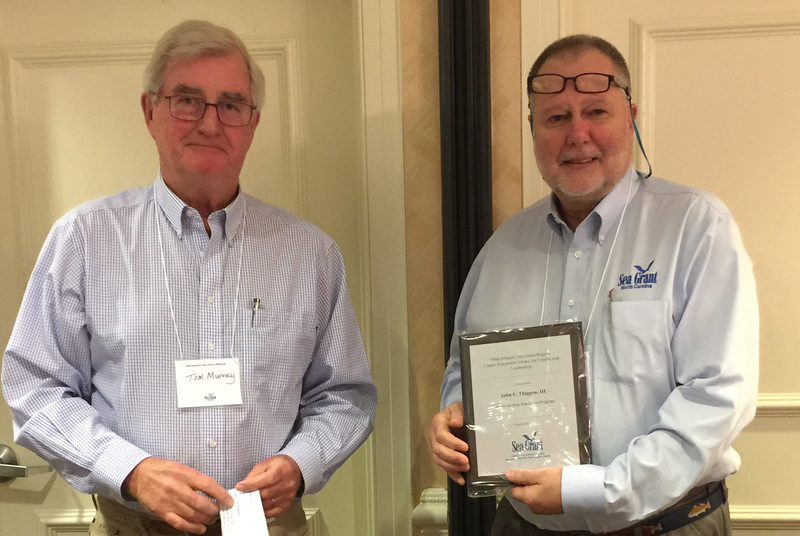 Jack Thigpen and Thomas Murray both received the Mid-Atlantic Sea Grant Career Extension Award for Vision and Leadership. “Lessons from those years, along with his family connections in coastal plain communities, his engaging personality and his professional training as a sociologist, combined to serve him as he moved to Raleigh to lead the extension program,” White notes. His skills were at the forefront of the state program’s recent and intensive strategic planning process. “He put his heart and soul into this process to confirm our updated focus areas, as well as to refine our goals so that they align with ongoing critical needs for coastal ecosystems, economies and emerging issues. The resulting plan is an excellent guide for our research and outreach in the coming years,” White adds. Thigpen also has served as a key advisor to regional economic development efforts, such as local seafood education for chefs and consumers, and nature tourism including paddling trails. An avid birder, he was a founding member of the North Carolina Birding Trail and continued to be active with the trail leadership over the past decade.